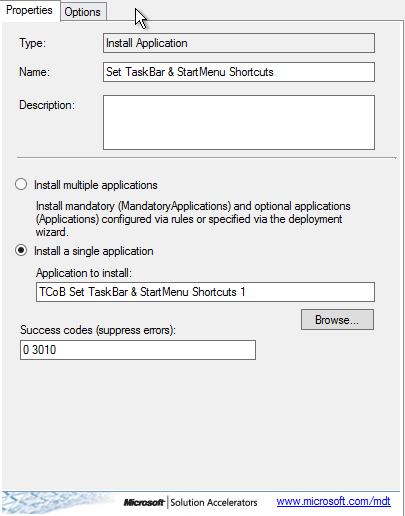 Below is how we stopped modifying the Start Menu & Task Bar shortcuts on our Default Image (GOLD IMAGE) using MDT 2013 Task Sequence. This applies to Windows 7 and I’m sure it could be modified to work with Windows 8.1. Check it out below and let me know if you have any questions. To do this, you are going to need the following scripts in a folder on your MDT 2013 Server. cscript C:\Users\Public\Downloads\PinItem.vbs /item:"C:\Users\%USERNAME%\AppData\Roaming\Microsoft\Internet Explorer\Quick Launch\User Pinned\TaskBar\Outlook 2013.lnk"
cscript C:\Users\Public\Downloads\PinItem.vbs /item:"C:\Users\%USERNAME%\AppData\Roaming\Microsoft\Internet Explorer\Quick Launch\User Pinned\TaskBar\Mozilla Firefox.lnk"
cscript C:\Users\Public\Downloads\PinItem.vbs /item:"C:\Users\%USERNAME%\AppData\Roaming\Microsoft\Internet Explorer\Quick Launch\User Pinned\TaskBar\Excel 2013.lnk"
cscript C:\Users\Public\Downloads\PinItem.vbs /item:"C:\Users\%USERNAME%\AppData\Roaming\Microsoft\Internet Explorer\Quick Launch\User Pinned\TaskBar\PowerPoint 2013.lnk"
cscript C:\Users\Public\Downloads\PinItem.vbs /item:"C:\Users\%USERNAME%\AppData\Roaming\Microsoft\Internet Explorer\Quick Launch\User Pinned\TaskBar\Word 2013.lnk"
cscript C:\Users\Public\Downloads\PinItem.vbs /item:"C:\Users\%USERNAME%\AppData\Roaming\Microsoft\Internet Explorer\Quick Launch\User Pinned\TaskBar\Publisher 2013.lnk"
cscript C:\Users\Public\Downloads\PinItem.vbs /item:"C:\Users\%USERNAME%\AppData\Roaming\Microsoft\Internet Explorer\Quick Launch\User Pinned\TaskBar\iTunes.lnk"
' have no warranty, obligations or liability for any Sample Application Files. '* 1.0.0 - 04/03/2008 - Created. '* 1.0.1 - 03/02/2009 - Used Replace in PinItem function to remove "&"
Const TRISTATE_TRUE             = -1  'Open the file as Unicode. Const TRISTATE_FALSE            = 0   'Open the file as ASCII.
" ""MODIFYUSERS.vbs arguments"" for Windows NT." '* Purpose:  Determines which program is used to run this script. '* Purpose:  Parses the command line. '* Purpose:  Pin item to the Start Menu. WScript.Echo "File to pin does not exist." '* Purpose:   Shows the correct usage to the user. '* Output:    Help messages are displayed on screen. WScript.Echo "This script is used to Pin items to the Start Menu or Taskbar." WScript.Echo " /item:<PathName>       Path of item to pin." WScript.Echo " /taskbar               (Optional) Pin to Taskbar instead of Start Menu." WScript.Echo " /? (Optional) Displays this help text." 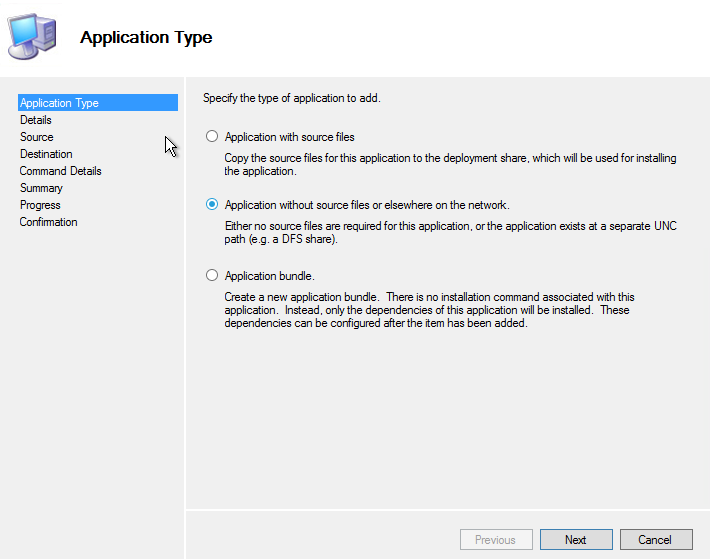 In the new dialogue box, select “Application without source files or elsewhere on the network” radius button. Next, add all the scripts above to your %DeployRoot%\Applications\Set_TaskBar_&_StartMenu_Shortcuts folder. 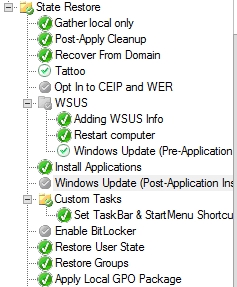 Under the State Restore section of the Task Sequence, add a “Custom Task” after your “Install Applications” item in the Task Sequence. After creating the “New Group” you can name it anything but I choose to name mine as “Custom Task”. Next, you need to add the application to your Task Sequence by selecting the “New Group” and clicking on Add->General->Install Application. When ever I make changes to my DeploymentShare I always update my Deployment Share for safe measures. It’s also because I never want to forgot to do it when I really need too. You should now have a new application that will set the Task Bar and your Start Menu Shortcuts without having to set them in your base image. p.s. I know there is probably a better way of organizing these scripts but in a pinch they worked and I haven’t gone back to look at other ways of doing it. How would I go about having different pinned items on the Start Menu and the task bar? For example I want my Start Menu to have Adobe, excel, power point, etc and my task bar to have IE, File Explore, calculator and office 2013. Your setup doesn’t seem to do this. I might be mistaken though.